Historian Michael Beschloss posted this on Twitter. [Grant] was, in many ways, a remarkable man, but ill-suited for the presidency. Of course, that begs question, what suits someone for president? I feel previous elective office is less a predictor than are temperament, character, leadership record, [and] a willingness to compromise. Washington, with little elective political experience; Lincoln, with much; FDR, with much; and Eisenhower, with none, stand out among our presidents to me. Only FDR had been a "successful" pol before taking office. All had successful, significant presidencies. The one trait they all shared is temperament. Washington & Eisenhower overcame/channeled volcanic tempers to be nearly perfect leaders, Lincoln overcame much and chose his way to a leaders' temperament; FDR had, as Oliver Wendell Holmes said, "a second class intellect, but a first class temperament." I'm not sure having an even temperament or self-control matters to voters in these zero-sum days. I was looking for pictures of street signs for Bleecker Street in New York City. It's such a great name that it begs to be included in songs. Of course, it has been. 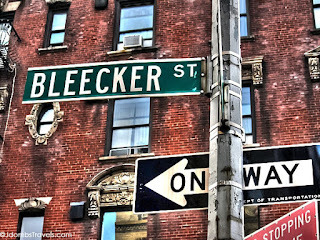 Bruce Springsteen mentions Bleecker Street in his song, Kitty's Back, from The Wild, the Innocent, and the E-Street Shuffle. I can't tell you how fresh and new Springsteen sounded to me back then. On hearing "The Boss," I agreed with music critic (and later Springsteen producer) Jon Landau that I'd heard "the future of rock and roll." Like Bono, who gave the speech inducting Springsteen into the Rock and Roll Hall of Fame, I loved Springsteen's passion. I also loved his lyrical genius, voice, melodies, and incredible backing band. Even this song fairly pops with creativity and power, Springsteen's guitar, Clarence Clemons' saxophone, and the brilliant interplay band and leader, who were already at the top of their game. Though Springsteen has had a long career, I think that he failed to be the future of rock and roll, playing out for me in a matter of a few years. (Of course, it's arguable that, with few exceptions, rock and roll is a thing of the past generally.) The last Springsteen LP that I cared for was Nebraska (1982). 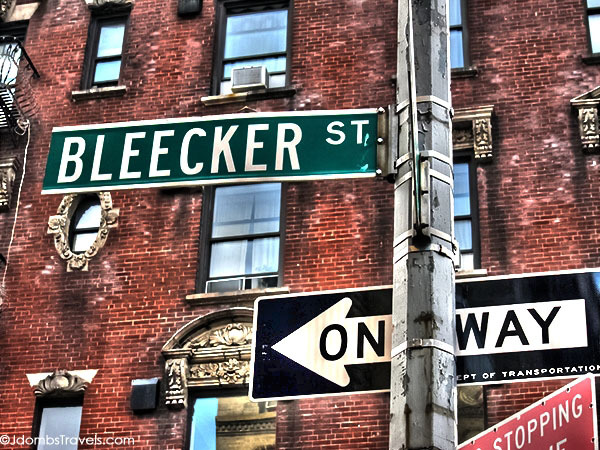 Simon and Garfunkel earlier sang about Bleecker Street in a song of the same name on their Wednesday, 3 A.M. LP. It's sort of a typical Simon and Garfunkel song from that period: faux-profound lyrics, a nice melody, acoustic guitar, pretty harmonies. Not bad for playing in the background when you're talking with friends over a glass of wine, but ultimately sleep-inducing. The duo gave us some terrific songs, of course: Sounds of Silence, Bridge Over Troubled Water, 59th. Street Bridge Song, and Mrs. Robinson. But they never did much for me and I enjoyed several of Simon's solo projects--Paul Simon, There Goes Rhymin' Simon, and Gracetown come to mind more than I enjoyed Simon and Garfunkel. From what I've read, I guess that Paul Simon did too. Bleecker Street is a prominent east-west thoroughfare in Greenwich Village. Clubs there played an important role in the rise of folk music in the late 50's and early 60s. This post on Wikipedia talks about other songs that mention the street. There ought to be a song that plays off the name, call it Bleaker Street. At the Concert for George, George Harrison's friends and collaborators sing one of his contributions to the Beatles' catalog. "In this space and time"
This was released on November 22, 2013. A friend sent the link for it to me. “You don’t need more faith. There is no ‘more’ or ‘less’ in faith. If you have a bare kernel of faith, say the size of a poppy seed, you could say to this sycamore tree, ‘Go jump in the lake,’ and it would do it." These words of Jesus are preceded by daunting commands to: (1) not be the cause of others falling into sin; (2) be ever ready to forgive a repentant friend even if the friend's weakness drives them back to sinning against you and repenting for their sin repeatedly. The disciples understood how hard both commands are. They thought they would need more faith to be able to fulfill them. In this passage, I believe that Jesus is telling us (telling me), Don't wait for a monster faith that will make it easy to do the things I command you to do. Nothing I command you to do--love God, love neighbor, make disciples, give to the poor, don't push yourself ahead of others, forgive your enemies--is easy to do. The question isn't how big our faith, it's how ready our obedience. It's been my observation that for we recovering sinners--we intrinsically selfish, if recovering, control freaks--the more we obey the God revealed in Christ, obedience doesn't become easier. It doesn't. * But the more we obey Christ, the more we want to obey Him. To have faith in Christ is to trust in Him alone. But faith is an abstraction until we commit ourselves--day-in and day-out--to seeking to obey Him, however imperfectly. We are only saved by grace through faith in Jesus Christ, as the Scriptures teach. And there's nothing we can do to be saved. Salvation for a life of peace with God, forgiven sin, and eternity with God is a gift we can do nothing to earn. But until we seek to obey Christ, our faith will remain an abstraction. Don't look for more faith, Jesus seems to be saying here. Looking for more faith is a delaying tactic. Instead, Jesus tells me to do what He commands of me with whatever faith we have. He will fill in the blanks in my courage, my deficient faith, my authenticity. Later in the chapter, verse 33, Jesus says: "If you grasp and cling to life on your terms, you’ll lose it, but if you let that life go, you’ll get life on God’s terms." Wanting more faith, as pious a request as it seems to be, is still grasping for life on my terms. "Fine things to do, Jesus, your commands," we effectively say. "But You're going to have to give me more faith before I can do them." The disciples, in making their request, and I myself whenever I think it or say it to God, are in essence, laying down conditions for obedience. "I couldn't possibly do any of that, Jesus," I say, "without bigger faith. You'll need to get back with me on that." This excuse is perennial. I've been guilty of it many times myself, I confess. But it's simple, really. If I trust Jesus even a little bit, I'm called to obey. No matter the size of my faith, it's sill a fact that He died and rose, so the power to do what He's called me to do exists, no matter the size of my faith. Besides, the One commanding me is the King to Whom my whole life (and the life of the whole human race) is accountable. So, the call is clear: I need to do what the King Who saves me by grace tells me to do. I am to do what He commands with little faith and quaking hands, with low competence, little stomach for it, and giant fears. I am to obey because it's not about the quantity or quality of my faith; it's about the greatness of my King and what my King does through obedient people. Today, Lord, help me to obey You, no matter the size of my faith. In Jesus' Name. When we seek obedience in doing the impossible things Jesus commands of us, we learn to rely even more on Him. That's faith. College football season begins in about forty days. As an Ohio State fan, I have to say that one of my favorite moments from last season didn't even involve the Buckeyes, but Michigan State versus the team up north. The game gets periodically re-aired on the Big Ten Network, from which the video above and the still photograph below are captured. I could watch the video again and again. It just never grows old! 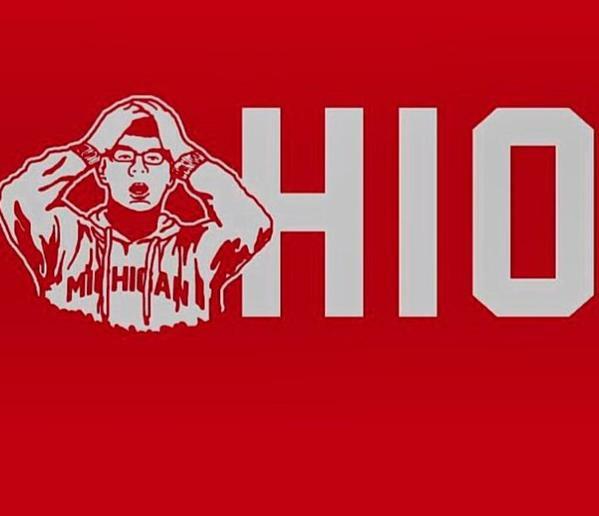 For we in Ohio, the moment brings guiltless schadenfreude for ttun. 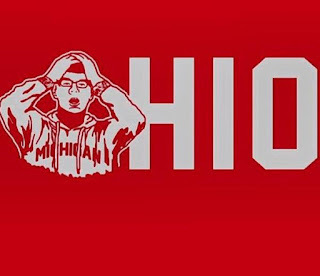 Immediately following that game, some enterprising shirt makers introduced the design below for Ohio State fans. By the way, when bowl season comes along, I root for every single Big Ten team to win. In non-conference games, I also root for all Big Ten teams to win. And when my favorite college season rolls around, basketball, I root for all Big Ten teams to do well against non-conference teams. What's good for the conference is good for every team in the conference. We watched this presentation from Louie Giglio this evening in Living Water Lutheran Church's sanctuary. It's worth the time and the time will go by quickly. I never get enough of this song. Love the bass on it. Except for the strings, McCartney played all the instruments. He also did all the vocals. This is the song to which Keanu Reeves and Sandra Bullock dance in The Lake House, a beautiful scene in a beautiful movie. Released in 2005, Chaos and Creation in the Backyard, from which this track is taken is, to my mind, one of McCartney's very best solo projects. Undoubtedly, its quality was enhanced by the willingness of young producer Nigel Godrich, best known for his work with Radiohead, to challenge McCartney. Macca didn't like being challenged, but, perhaps in deference to Beatles producer George Martin, who had recommended Godrich, he stuck it out. In interviews I've heard, McCartney still seems reluctant to credit Godrich's insights into Macca's material for this extraordinary LP. It's also telling that the two have never worked together since. McCartney is a master of melody, of course, and one of my favorite musicians. But for Chaos and Creation in the Backyard, I think that he should be thankful for how Godrich challenged him to shy away from many of his old tricks, helping him, by dint of his own remarkable talent, to produce yet another classic among McCartney's other memorable releases. This is one of my favorite songs to sing with. I loved Withers' songs and when he soared into the upper reaches of his voice, it was stronger and affecting. Once, a group of us, including my son, stood outside a venue near the campus of the University of Cincinnati waiting to see, I think, Delirious? (The question mark was part of their name and, for a time, they were an astoundingly good band.) We hadn't purchased tickets in advance, intending to buy them at the window. Someone from a radio station approached me and said, "If you'll sing for us, we'll give you free tickets." My son and I broke into Lean on Me and we got our tickets. I think that we even sang in tune. The sentiment of this song which I wish I more faithfully conveyed to my friends: lean on me. In the 90s, several bands did covers of this tune, including dcTalk. Taken from A Hard Day's Night. It's such a simple, beautiful song. When McCartney brought And I Love Her to the rest of the group, he simply played the chords with no thought of doing anything else to it. It was Harrison who came up with the deep little riff that introduces and moves through the song. It makes it memorable. "While the world goes on without us, all around us." Sang this during worship on Sunday. Today brings us to the second installment of our series, Christ, the Fullness of God, based on the New Testament of Colossians, from which our second lesson is coming over these four weeks. To even begin to understand today’s second lesson--and I’m only beginning to understand it myself, I confess--we must reckon with the understanding of the Church from which Paul wrote. You know, in today's world, when people get around to selecting a church community for themselves, they're moved by factors like: "The people are nice." Or, "The preacher's sermons are short." Or, "They've got things for the kids." Or, "They never ask for money." We can be superficial, looking for what's in it for us, looking for a church that won't make waves in our lives. This would have been totally foreign to Paul! He had a different understanding of Church. In that moment, one of the many things that Paul learned was this: Whatever impacted the Church impacted the living and risen Christ. The crucified and risen Jesus Christ is one with His Church. His Church is one with Him. And His people are one with each other. If Saul was persecuting the Church, he was also persecuting Christ Himself. It’s a lesson that Saul, now Paul, learned and taught well. “Now you are the body of Christ, and each one is a part of it,” Paul would later tell believers in 1 Corinthians 12:27. Paul understood that through Christ, disciples of Christ are knit together with Christ and with each other. We are one with our King, Jesus, and with all who profess Jesus as Lord. The verses that come after last Sunday’s second lesson (1 Corinthians 1:1-14) and before today’s, are among the most beautiful in all of Scripture. They were read near the end of this past Tuesday’s installment of Louie Giglio’s Passion films, Colossians 1:15-20. There, Paul recites an early Christian poem or hymn. He does so because, as you’ll remember from last Sunday, the Colossian Christians were mixing other religions with their Christian faith. But, Paul wants them to remember that Jesus is God and only the God we meet in Jesus is worthy of following. The hymn reminds us that through His death on the cross, Jesus, the fullness of God, God on earth, makes peace with all who turn from sin and trust in Him. And He does it not from a distance, but by taking on the limitations of our flesh, taking our place on the cross, the sinless sacrifice for our sin. God won salvation for all who repent and believe in Christ with the sacrifice of His flesh and blood. This is the most eternity-changing truth we will ever encounter. Yet, Paul has learned that the Colossian Christians are starting to turn from following Jesus, treating Jesus like just another item on a religious menu. They seem to have forgotten Who Christ is or what Christ has done for them. Paul writes to them from prison. Please take a look at our lesson, Colossians 1:21-29. Years ago, a man came to me in my office. He had made a mess of his life. He drank excessively and used drugs. There were brushes with the law. There were numerous false starts on new careers that only ended with failures. There had been a wife who left him because he couldn’t be relied upon. It finally dawn on him that maybe he needed God. After our first meeting, I met with him weekly over a period of several months. He started attending worship, then Sunday School. In the meantime, he got a job and started doing well. He met a woman and they became engaged. Then, as quickly as he showed up at my office, he was gone, off the radar. He didn't answer my phone calls or emails. God had helped him through his rough patch. Things were now going well. God didn’t seem as essential to him any more. He forgot all that Christ had done to redeem him, to make him new, to set his feet on solid ground. He walked away from God. As our second lesson begins, Paul pleads with the Colossian Christians to not forget all that God had done for them in Christ, not to walk away from Christ! In His own flesh, Christ had bridged the chasm between God and them, Paul reminds them. To all who repented and believed, Christ had brought new life with God that never ends. But the Colossian Christians developed what Paul calls elsewhere “itching ears." They were enticed by other religious systems that, unlike Jesus, didn’t tell them to take up their crosses--in other words, to confess their sins and own their need of God--and follow Him. For anyone who holds onto the futile desire to be gods over their lives, the Gospel can be tough to take. And that includes all of us because all of us have inherited from Adam and Eve a desire to "be like God." Paul was calling the Colossians to remember the most basic confession of Christian faith: “Jesus is Lord." Only Jesus can make sense of my life. Only Jesus can give me God’s presence today and life with Him beyond death. There are two things that make these words strange, I think. First, Paul is rejoicing in suffering. Is he sick? No. This is the same rejoicing offered up by the very first Christians when facing persecution. When I first came to faith in Christ at the age of 23, I thought to myself, "Now what?" I believed; now I wanted to know what I needed to be thinking and doing to live out that faith. I knew that the New Testament book of Acts was the history of the Church from the risen Jesus' ascension until about 60 AD. "Maybe," I thought, "I should read Acts to find out how to be a Christian." I remember reading Acts 5:41 in the study of the house we were renting at the time and starting to weep. "Oh, God," I prayed, "give me a faith like that." Paul was happy that his suffering wasn’t for something wrong he had done, but for his faith in the crucified and risen Jesus. And he was happy too, because his suffering was a witness that pointed others to Christ. Listen: If people get mad at you for being faithful to Christ, you’re doing something right! It’s important to remember that Paul is not saying that Christ didn’t do everything necessary to win freedom from sin and death for all who repent and believe in Him. Christians don’t have to suffer more than Christ suffered in order to be saved. In fact, the Greek word for sufferings used by Paul here, παθήμασιν, isn’t even the same word used of Jesus’ passion and death on the cross in the New Testament. What Paul is saying is that until the day Jesus returns to the earth to raise the dead and bring His kingdom fully into being, Christ’s afflictions will continue to be experienced by His people, the Church. We who trust in Christ will complete the Church’s story of suffering at the hands of the world for being disciples of Christ who share Him with the disbelieving world. That’s part of our oneness with Christ and with our fellow disciples. Just as Christ has reached down into our humanity, experiencing everything we experience in order to fully connect with us, take the punishment we deserve, and buy us out of slavery to sin and death to give us eternal life with God, we also connect with Christ in His sufferings as He lifts us up to Himself in heaven. We share Christ’s suffering in that, as we bear His name, we’re subject to the same rejection that He endured. But we also have the hope of glory He secured for all who believe in Him when He rose from the dead. That’s what Paul was experiencing while imprisoned. The blessing that comes when people like Paul live in enduring faith in Christ is that it inspires and upbuilds the Church. It even wins new disciples. We all remember the execution of Egyptian Christians perpetrated by ISIS last year. Twenty-one people were killed, all of them confessing, “Lord Jesus Christ” as they died. But you’ll also remember that it was later learned that only twenty of the executed had been Coptic Christians before the moments of their deaths. A twenty-first had not been. But, impressed by the faith of the Christians with whom he would die, rather than renouncing them or Christ, he embraced Christ as his Lord. He too died confessing, “Lord Jesus Christ.” This is what happens when we endure in faith. Eternity gets changed. We become one with Christ and with His people, the Church. Brothers and sisters in Christ, may we who belong to Christ and to each other strenuously, lovingly, and with every ounce of energy Christ gives to us, proclaim Christ, admonishing and teaching each other with God’s wisdom so that we may all become mature followers of Christ, fully prepared to live and share the hope Christ gives to us with everyone we know and meet.